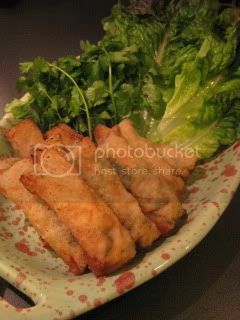 Here's my new version of seafood spring rolls ("Harumaki" in Japanese). The addition of the shiso leaves and shekwasha (Okinawa citrus) totally upgraded this dish and added such nice "fresh" flavors. I brought back a bottle of straight shekwasha juice from Japan. 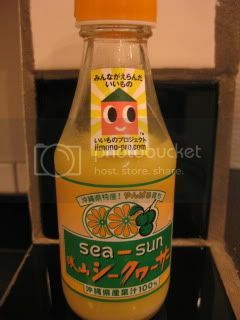 This special citrus from Okinawa has such a rich citrus flavor. But, you can substitute it with lemon juice if you can't get shekwasha juice. For the filling, combine 6oz shrimp (peeled and deveined, then minced), 4 large scallops (sliced), 1/2T potato starch, 10 shiso leaves (thinly-sliced), 1T shekwasha juice (or lemon juice), 1/2T shio-koji (or 1/4tsp salt), and 1/4tsp black pepper and mix well. 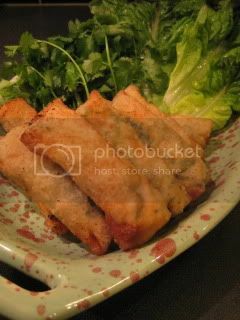 Get 6 square spring roll skins and cut each in half diagonally. Divide the filling into 12 and roll with the skins. 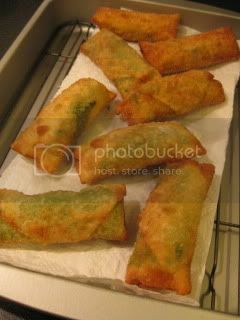 (To roll, put the filling in the longer side of the skin, fold two corners in and roll. Seal the end with egg white. Combine 1/4C rice wine vinegar, 2tsp raw brown sugar, 1/2T soy sauce and some dry red chili slices in a bowl. Stir until the sugar is dissolved. 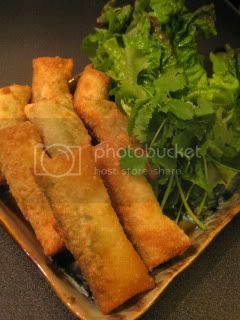 The following night, I made vegetarian spring rolls with tofu, shiso, and camembert cheese...these were also super tasty!